My attempt at play on words for the title: “Baring the Bering”…… somewhat fitting as what we have been doing is literally trying to uncover and expose the hidden truths and secrets that this sea has to offer. I have become more comfortable with the scientific terminology being used on board and also have gotten into a nice flow with the overall processes going on and with the actual procedures and techniques being utilized to conduct these investigations. In the last blog entry, I was discussing the work I was doing alongside the oceanographers. I have been continuing this work and adding additional learning outcomes each day as this team throws more and more learning opportunities my way. For example, yesterday we were dealing with primary productivity. This study is essentially trying to determine the rate at which photosynthesis is occurring. The amount of Phytoplankton–autotrophs (Self-feeders) obtaining their energy from sunlight–varies in different ecosystems as well as over time. For example, for the school where I teach, Sandy Hook, NJ is a nearby coastal estuarine system. Being an estuary and at mid-latitude, we have very high nutrient levels compliments of river runoff (in fact, excess runoff leads to algal blooms…think of it as pouring liquid Miracle-Gro into the waters and the resulting bloom that would occur. In the end, unfortunately, it leads to eutrophication, decrease in O2 and potentially fish kills) as well as strong sun angle. Therefore, we have large availability of productivity and biomass. The Bering Sea also has tremendous productivity and therefore biomass as well. 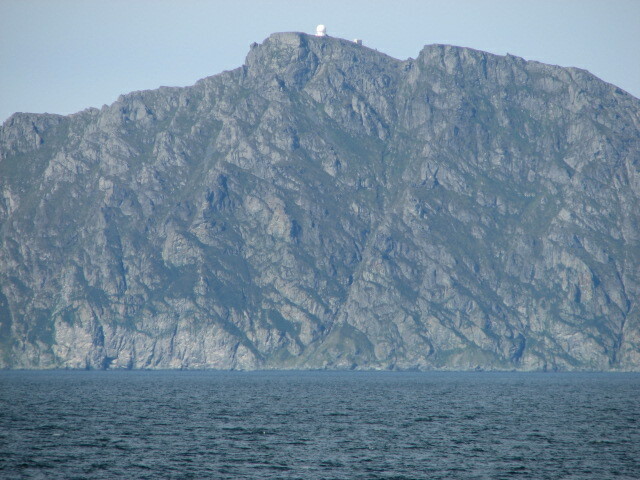 Here, the relatively shallow seas of the Bering allow the Phytoplankton to transfer solar energy into chemical energy within the photic zone (area in which sun can penetrate). This coupled with the upwelling of nutrients off the shelf-break create the base of the food chain within these valuable, productive fisheries. There is still a lot of uncertainty as to the transport and fate of this setup but it is clear that we need to learn more and concentrate our efforts into putting these pieces together. So, the actual procedure is to again take water from the CTD’s (explained in last Blog) Niskin Bottles at various depths and then “feed” these marine plants nutrients and give them there other ingredient to conduct photosynthesis, which is sunlight (they are already in H2o). We then take these samples and put them into a tank which is on the deck of the boat and has continuously circulating water. We also put on Mesh Nylon bags to mimic the light concentration from the various depths they were taken from. So for example, a sample taken at surface or near surface may be left without coverage whereas a sample taken at 50 meters may have two bags over the bottle and scatter the light entering to be representative of the light conditions the sample came from. 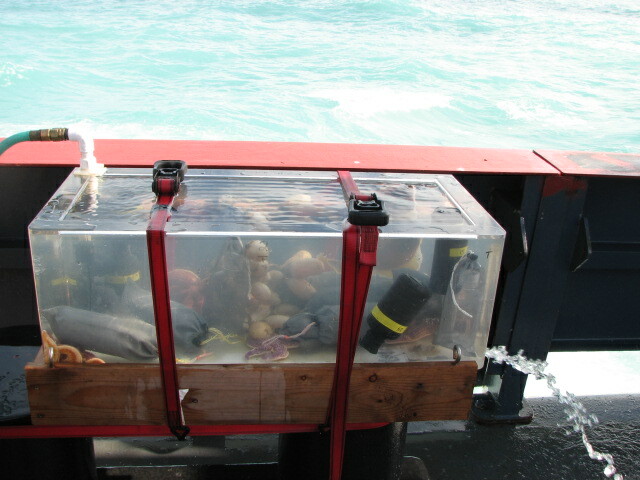 In the picture below, you can see this tank, the bottles under experiment (the gray bottle in lower left is one with a mesh bag for light reduction and the dark bottle in the lower right allows no light through and is the control) and the continuous water circulating output in the lower right hand of the tank. Now, the cool part of this, is that the nutrients that we introduced to the sample have been “laced” by stable isotopes of Carbon and Nitrogen. This way, after the sample has been filtered and the chlorophyl analyzed, we can make certain assumptions about how productive these phytoplankton are based on the isotope markers. I cannot emphasize the importance of these producers enough. Think of them as being the base of a pyramid (which is often used by ecologists) — if they are removed, all of the other trophic (feeding) levels cannot exist. It takes a tremendous amount of producers to feed fewer and larger carnivores. This has to do with a rule in Ecology/Biology refered to as the “10% rule”. We cover this in class and will review it in more detail. In the interim, check out this website for pre-reading information on the flow of energy in an ecosystem. Ok, so for the next few blogs, I will start to debrief my followers on my experiences aboard the Oscar Dyson as they relate to the Fisheries end of this cruise and tie it into the Oceanographic studies I have spent the last few entries explaining. I figured it made most sense to start at the base of the food chain and make my way up to the higher ordered species and then summarize with the interactions of all components for the Bering Sea and in turn, our global sea that represents 97% of all of Earth’s water supply. In the interim, check out Where I am, almost real-time HERE. From this site, you can obtain current latitude/longitude, wind speed, water temp etc. As I noted in the last blog, Hurricane Irene was a real threat to the East Coast and NOAA’s “Hurricane Hunters” (see last blog entry) did an excellent job at keeping the public informed about the status of the storms strength, location, and traveling direction. I brought it up last entry to illustrate the depth and scope of NOAA as an organization. Now that she has come and left her mark, lets take it one step further. Many places in the Mid-Atlantic received over 10″ of rain. Can you name two major river basins along the East Coast that drain into the Atlantic Ocean? If this water travels over millions of people’s yards (that have been heavily fertilized), and farming areas with livestock, think of the nutrient input into the Atlantic Basin. Relate this to the work currently being done on the Oscar Dyson. Remember, that off our coast of NJ, we often have to worry about an influx of too many nutrients and algal blooms…..If you want to learn more about causes/effects, then read this website about eutrophication. 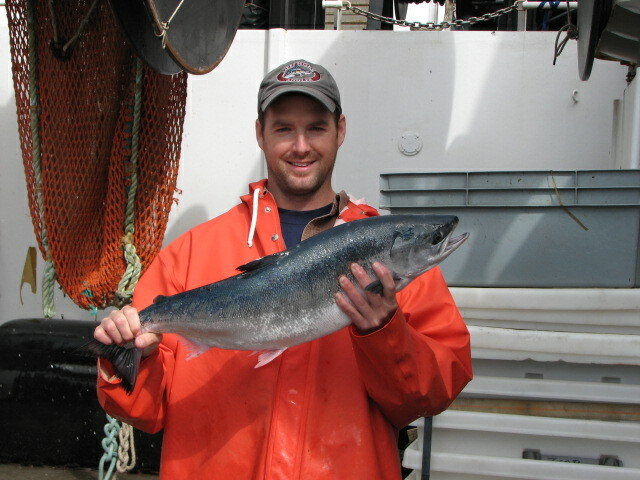 This entry was posted in 2011, Kevin Sullivan, NOAA, NOAA Fisheries Service, NOAA Ocean Service, NOAA Teacher at Sea and tagged 10% Rule, bering, Eutrophication, fisheries, productivity, ship locator, trophic. Bookmark the permalink.